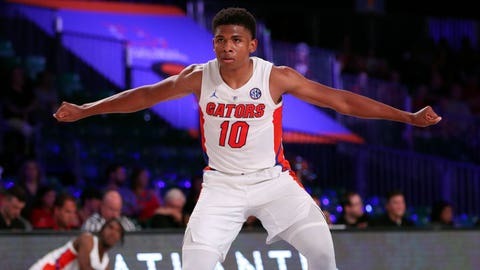 Noah Locke scored a career-high 18 points, Deaundrae Ballard added 15 and Florida handled North Florida 98-66 Tuesday night. GAINESVILLE, Fla. (AP) — Florida is finding points and energy from a couple unexpected sources. “No one on our team plays any harder than Noah,” Florida coach Mike White said. Ballard, a sophomore from Atlanta, is giving White production off the bench. Ballard reached double figures for the third consecutive game. He had a career-high 19 points in Florida’s last game against Stanford. “I’m very proud of his progression,” White said. North Florida: The Ospreys got a taste of what’s to come with a challenging, non-conference schedule that includes trips to Minnesota, No. 15 Florida State and eighth-ranked Auburn in December. Coach Matthew Driscoll hopes it better prepares his guys for Atlantic-Sun Conference play. Florida: The Gators notched their third win in as many games at home, all against overmatched opponents. Their next one in the O’Connell Center won’t be a pushover since No. 9 Michigan State visits Dec. 8, which follows a game against West Virginia. “I can tell you one thing: we’re not shooting 57 percent against either one of those teams,” White said.